We are from the lucky ones: our entire “office” is literally within a computer. Wherever this computer might be, our office comes along. That is why, almost one year ago, we introduced remote work as an option. We can work from wherever we feel like, for specific days each month! Below I am going to present to you the benefits that working remotely may have for you and your team, as well as the particular way in which we apply such practice, so that you get some ideas on how to begin. 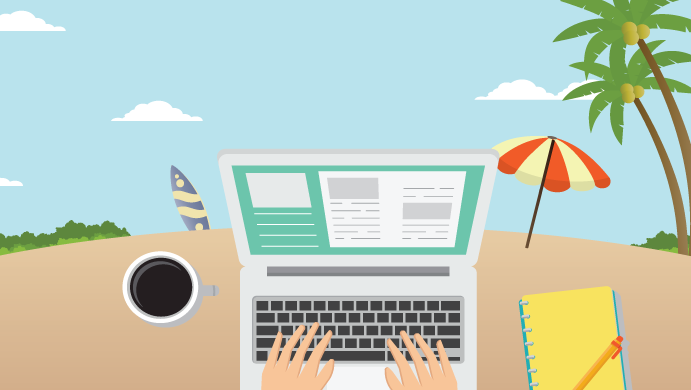 It has been reported that those working remotely increase their productivity and performance. Based on research, 30% of the employees who worked remotely stated that they managed to achieve more in less time, while 24% stated that they have achieved more in the same working time. Whether you work from home or from any other place (library, café etc. ), most factors that distract your attention disappear. Noise from the department next door, colleagues chatting at the hallway, questions that are likely to interrupt you frequently… all that is significantly limited, leading to better focus and productivity boost! 69% presented less percentage of leave from work due to psychological reasons (“I am not in the mood to go to the office today”). The secret lies beneath the fact that you work in a way that suits you first and then the company itself. Moreover, the imperative need of your presence to the office is a stressful factor – just like when you went to school! It is very important to have options at your work, in avoidance of not feeling that there are compulsory rules to follow. Dress code is a fine example. At TopHost, we do not have any dress code and therefore we are free to wear anything we feel comfortable in to come to the office. However, even if there is no dress code where you work, you will definitely feel much more comfortable at home, wearing cozy clothes or even your pyjamas! The exact workplace is another example of unlimited options. Despite the office, no matter how pretty or functional (ours is a Great Place to Work! ), sometimes you may want to change your perspective or point of view and work – why not? – from an exotic destination, a beach, or a café at the city center. Finally, through remote work you have the opportunity to work side by side friends or your significant other, taking in even more positive energy, which will increase your productivity! It might sound contradictory, but people that work remotely are often more tied to their colleagues and consequently to the company and its vision. The one inspires and motivates the other more than what happens within the office. When we are at the office, it is likely to take our relationship and contact with the team for granted, even subconsciously, and not try a lot to come closer to our colleagues. On the other hand, when somebody works remotely, s/he has a bigger need to communicate and get in touch, which in turn results in the enhancement of team bonds! All the tools created for remote work available online help with that and you need to evaluate them: group chat, video calls and online tools for scheduling tasks and keeping track of projects are some of them! You certainly realize the positive impact working remotely has on the environment. The fewer the cars on the road daily, the better! Research has shown that those working remotely have managed to reduce their energy footprint, contributing effectively to the protection of the environment. According to WWF, commuting takes up 35% of the total energy footprint. During our planning for working remotely, we did significant research regarding the actions applied by other companies, as well as regarding the assurance of our customers’ personal data protection. Therefore, we have created an internal guide with the staff’s obligations and rights on working remotely. Communication is one of the fundamental priorities for our team, not only when we are in the same working place, but also when we are online. To that end, we have installed tools such as Slack, assisting our teams to remain close and maintain their productivity, even when it comes to remote work. Remote work is a practice based on trust! Thus it needs to be handled with the proper professionalism on behalf of the staff, so that each team may function effectively. For the effective completion of remote work, it is necessary to clearly define tasks that need to be completed. It is of the essence to define the tasks, set out the right deadlines and eventually evaluate the outcome for any potential corrections to be handed out. Consistency and effectiveness should be ensured both within and outside the office. The safety of our data, as well as the data of our customers, is the most important part about working remotely. As a consequence, we have taken all the necessary measurements, so as to be able and work in safety. At the same time, we have run the right security programming in case of theft or loss of our equipment, in avoidance of third parties being able to gain access to data about the company. Even though the role of each team manager / supervisor remains important when working remotely, it is equally important for us to proceed with personal, continuous self-assessment. It is of the essence to develop on a daily basis the capability of self-assessment, so as to see in practice whether or not working remotely is a way of work that suits us. It has been reported that repeating procedures not been clearly defined may be a cause for delayed tasks, even when we are all in the same room! Therefore we identify the procedures that we most frequently repeat and structure the steps that need to be followed. So the time of completing a task is reduced to an impressive extent! Finally, an important aspect is that of team updates during the day and the working hours each of us will follow when working outside the office, as well as their availability during this time. To coordinate better, we have created a calendar only serving that purpose, where everyone logs in their timetable. Therefore, we may all consult the calendar and know at any given time if somebody works remotely or is on leave. At the same time, all departments have their own channels at Slack to declare their status throughout the day: if someone wants some time without any distractions to finish a task, he sets his status to “busy” or if he stops for lunch, he sets his status to “break”. In this way, we are able to know the availability of our colleagues, even without their physical presence at the office! 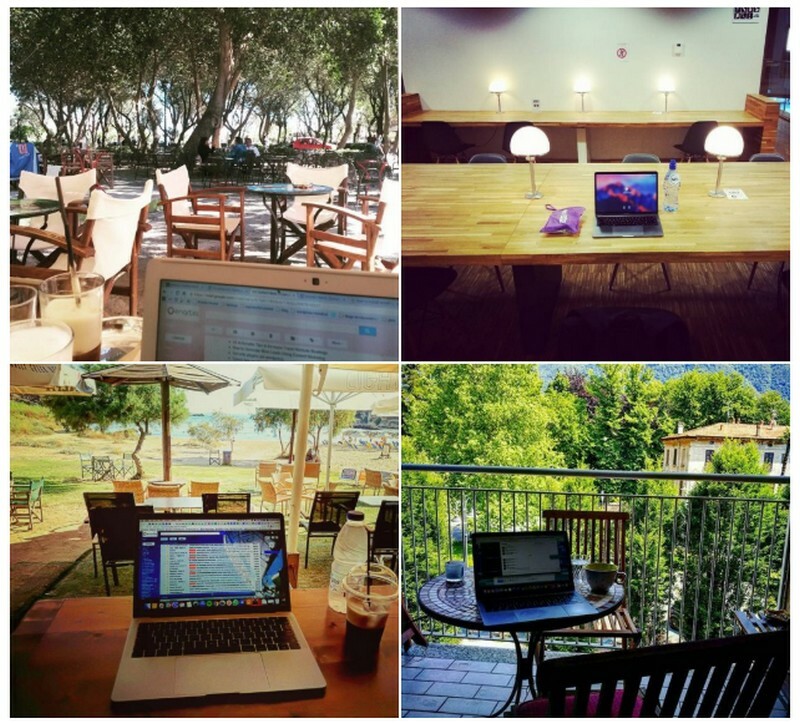 Τhe benefits of remote work are more than obvious, in terms of mood and productivity alike. You should definitely give it a try! As for us, we’ ve expanded this practice even more. Some of our colleagues now work remotely on a regular basis, even half the globe away! Check here our job openings in case you are interested in joining our team. ← TopHost launched a new status page!